I love this time of year - the pretty lights, dark nights, Christmas music, sparkling decorations, cold weather, hot chocolate, presents, and happy smiles. It is a season of celebration. Everywhere you turn there is a reminder to celebrate! There is a purpose to this season, a reason to be joyful and have hope. I started listening to Christmas music over a month ago. Why? Because it is never too early to celebrate our God coming to earth! What wondrous love God has shown us in sending His Son! "Dear friends, let us love one another, for love comes from God. Everyone who loves has been born of God and knows God. Whoever does not love does not know God, because God is love. This is how God showed His love among us: He sent His one and only Son into the world that we might live through Him" (1 John 4:7-9, NIV 1984). Love came down. God sent His Son, Jesus, the Messiah. Immanuel. God With Us. Prince of Peace. Bread of Life. Light of the World. Savior. Jesus came to earth as a baby. The God of the universe came to dwell among fallen people - doesn't that just astound you? Doesn't it make your heart sing? God loved us so much that He came down to live among us and save us from our sins. He lived and suffered as we do. He was tempted, yet was without sin. He was a perfect and holy sacrifice, and He willingly gave His life to redeem all who will believe. Love came down, died for us, and rose again. If that isn't a reason to listen to celebrate, then I don't know what is. My prayer for you today, dear friend, is that you will know the mercy and grace of God, that you will have His peace and joy in your life, and that this Christmas season you will truly celebrate God coming to earth. I like the Love Came Down collection from DaySpring because the items are not just beautiful decorations, but they have words that express the meaning for the celebration of this season. 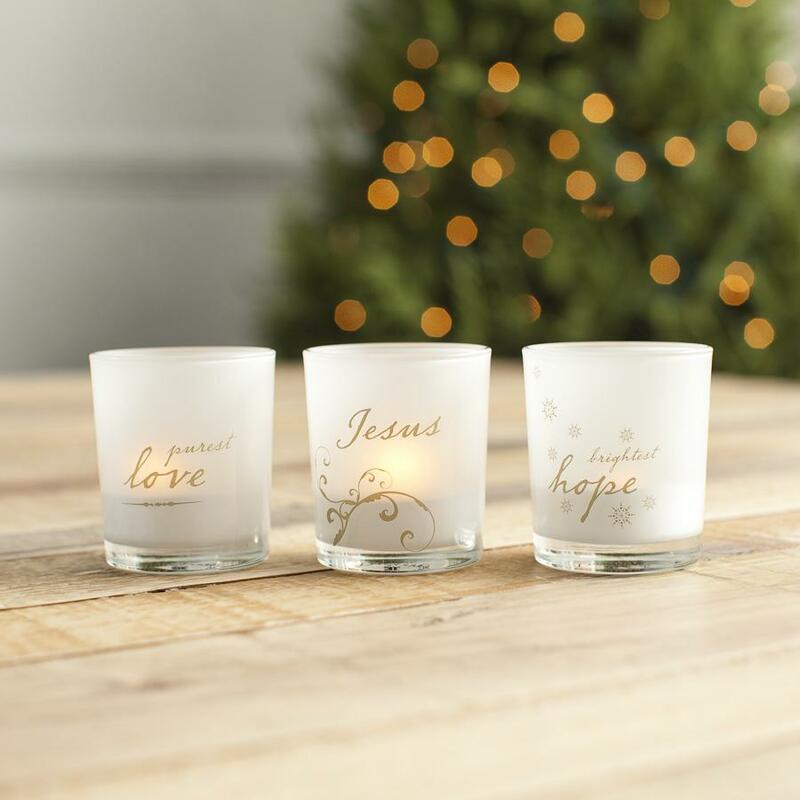 Every piece of this collection is a reminder that Jesus came to earth, a reminder to celebrate. 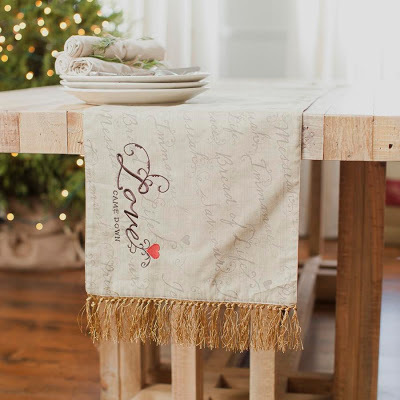 One of my new favorite items is this reversible Table Runner. It is just beautiful! Our table is too small for this large table runner, so instead I am using mine for a tree skirt. It works very nicely, I think! DaySpring has provided me with these lovely items in exchange for a story/review post. All words and opinions are my own. I appreciate these items from DaySpring very much, but I do not have enough space to use them all. I would like to give these Tea Lights and Advent Calendar to one of my readers! Just leave a comment to enter. A winner will be chosen and notified by email on Monday, November 26th. This is my favorite time of the year. There is a sense of wonder and joy around every corner. Peace and joy to all! I also love the celebration of Christ this season...and the decorating is just icing on the top!! I love the Dayspring Christmas collections...so pretty! Love your blog, Rachel! The October-December stretch is my favorite time of year :) so much to look forward to! Thank you so much for the giveaway! Very thoughtful of you! You are entered, Melanie! If you are interested, I can send you info so that you can sign up to host a review on your blog too. DaySpring packages are the best! Thanks, Audra! Yes, there is so much to look forward to this time of year!